SNP ministers plan to create “low emission zones” (LEZs) in Glasgow, Edinburgh, Aberdeen and Dundee by 2022 in an effort to reduce health problems linked to air pollution. Nationalists have argued that the move is necessary because there are more than 1,500 preventable deaths each year due to air pollution. 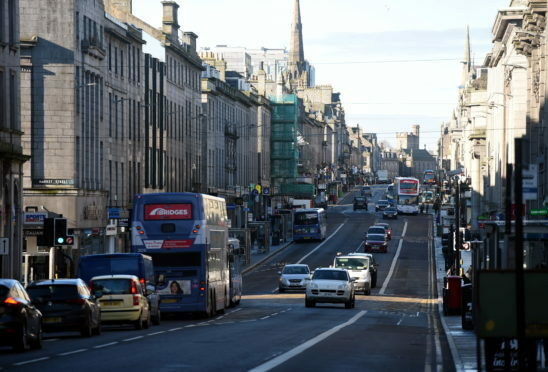 Market Street and Wellington Road in Aberdeen are among the worst affected streets in Scotland. Under the scheme, motorists will have to pay up to £100 if caught driving through the areas in vehicles which do not meet strict environmental standards. Transport Scotland has estimated that the project will cost £140 million in its first 10 years. Yesterday, the Scottish Conservatives described the plan as an “ill-conceived gimmick” after a study said it would prevent just one premature death every year. Tory environment spokesman, Maurice Golden, said: “This study shows what the real motivation is for the SNP when it comes to such initiatives. “They have been caught out once again announcing ill-considered gimmicks rather than taking an evidence-based approach. “All the while, motorists and businesses will have to pay the price. Last night, a government spokesman stressed that ministers remain “committed” to the project “in order to protect public health”. The spokesman said the government had supplied £10 million to help councils deliver the scheme, and to cover the costs of modifying buses.